Northern stations around the U.S. and Canada have experienced snow and ice for months. Now winter is arriving south, with snow predicted this weekend for Delta's largest hub in Atlanta. However, Delta's de-icing teams say bring it on. They've been training since summer at the Minneapolis-St. Paul hub on how to properly remove and prevent ice and snow buildup on aircraft – key to a safe takeoff during the colder months. 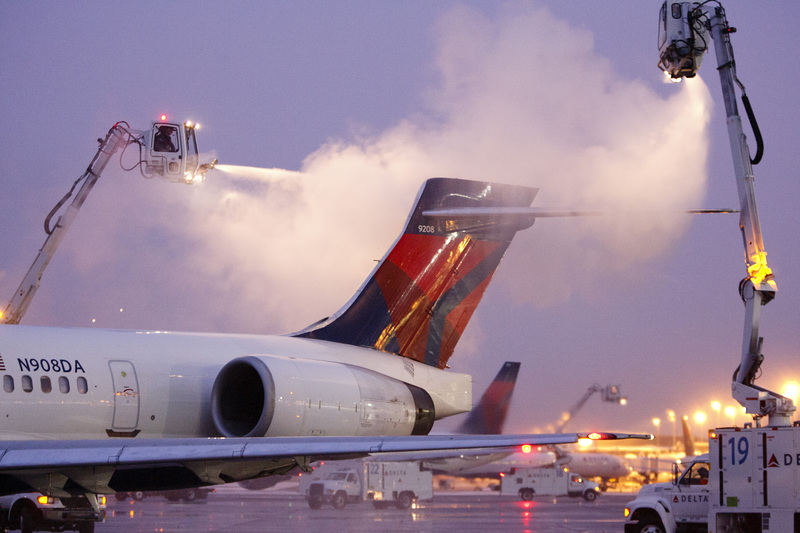 In a video, de-icing instructors from Delta's intensive training program explain the why and how behind de-icing to below-wing employees from across the airline. "It's all about the safety of our passengers and making sure the aircraft is completely clear of frost and ice before it takes off," said April S., an Portland-based Airport Customer Service agent attending the training. One of the many things agents learn at the training is the difference between the de-icing fluids used to spray down the planes. "Type 1 is orange and has the consistency of water. It's heated and is used to clean the aircraft," said Thomas V., an Atlanta-based Senior Facilitator – Airport Customer Service Learning​. "Type 4 de-icing fluid is green and has the consistency of oil, and it's used to protect the aircraft and keep contamination from sticking to it." Instructors also demonstrate proper driving patterns and spraying application in the de-icing trucks. After the program, trained employees will bring back their new skills to their teams and do additional training in their own trucks. "It's better to be prepared," said Pete C., ACS – Portland. "That way when the bad weather comes, we've got a handle on it."